A campaign in Henan Province, which sees numerous tombs being leveled, is being publicized by local governments as creating new farmland. However, this has caused outrage among residents and observers. Zhoukou, in the east of the province, was chosen in late May as a pilot area where all tombs should be leveled within three years. There are over 3 million graves in Zhoukou, occupying over 2,300 hectares of farmland, with just under a quarter of them in the county of Shangshui alone, according to local government documents. It takes a three-hour bus ride from Zhengzhou, capital of Henan Province, to Zhoukou. In the south of Zhoukou city, about 10 kilometers away is Shangshui county, which is the epicenter of the program. Twenty-eight villages have been selected within the county, including Zhuji, which draws part of its income from being an agriculture demonstration base and from its vineyards. "Why was our village chosen?" asked Zhu, a local grape farmer. In his 50s, Zhu wonders why all the tombs in his village have been leveled, while those in some nearby villages stand intact. Zhu is infuriated when seeing his parents' tomb leveled two months ago. "I felt very uncomfortable and couldn't accept this, because it has only been four years since my mother passed away," said Zhu, adding that the coffin had been exposed when he had been forced to knock the tomb down. Two other family tombs, which contained his grandfather and great-grandfather, were also leveled. He received 600 yuan ($94.5) in total as compensation, 200 for each tomb. Zhu said he could have accepted the policy if only the older tombs had been demolished, since those buried there had been dead for decades. Zhu's views were echoed by Liu, a villager from Liupo, just over a kilometer away from Zhuji. "Grave mounds that are over two generations old can be leveled, but those of people's parents and grandparents should be maintained," Liu told the Global Times. He added that although villagers were complying with government policies, they felt that their feelings should have been taken into account and their voices heard. Although their opinion was solicited before the policy was implemented, it was a mere formality. "We were asked to sign a document saying whether we agreed or not, but nobody dared to disagree, because it was like receiving an order," said Zhu. Farmers were allegedly told that their tombs would be leveled by bulldozers and they would not get the 200 yuan compensation at all if they refused. In Zhu's village, a cemetery is still being built, which is supposed to hold the ashes of the dead. "Only very few people transfer their ancestors' ashes from the buried coffins to the cemetery," said Zhu, adding that only rich people could afford to do so. Even if Zhu was able to afford it, he said he would not do so as it flew in the face of customs and might bring bad luck. He didn't know where he could now offer sacrifices to his ancestors, especially to his parents during the Spring Festival and Tomb-Sweeping Day. "This is just as bad as demolishing city walls in Beijing, which is destroying traditional Chinese culture," Zheng Fengtian, professor at the School of Agricultural Economics and Rural Development of the Renmin University of China, told the Global Times. "Tombs are where people worship their ancestors, and they should be maintained well. Ancestors' tombs to the public are like a national monument to Chinese people," said Zheng. Zheng said the policy was a waste of manpower and money and would not increase available farmland as publicized. All over Zhoukou, more than 140,000 tombs have been leveled so far, resulting in 80 new hectares of farmland, China Land and Resources News reported in mid-August. But for local farmers, these new fields will not be used to plant crops. "In my village, most people's ancestors are buried in their own farmland. They won't plant on the graves even after they have been leveled," said Liu. Furthermore big machines like combine harvesters still have to steer clear of the grave areas for safety concerns. This might not be what officials were expecting. When mobilizing people to level tombs, Li Duoyi, director of civil affairs in Shangshui, said in July that the machines would not need to stay away from the grave areas after the leveling campaign was over. Around the county, slogans can still be seen, encouraging people to level tombs to create more farmland. 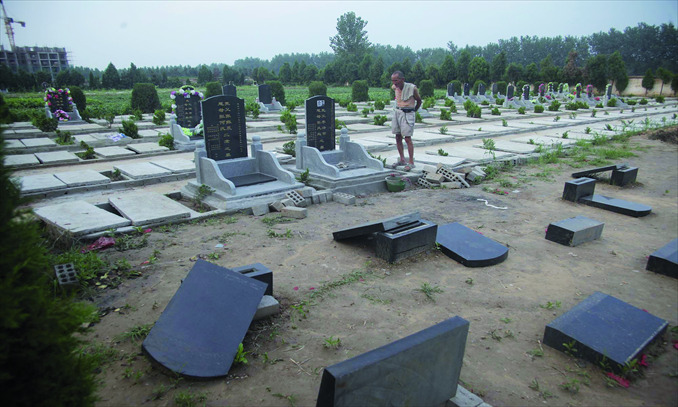 "Destroying tombs isn't suited to China's national conditions, and the policy must be stopped," said Zhang Cunyi, a funeral director in Henan Province, adding that some officials had clearly decided to introduce these policies without understanding the reality on the ground. Zhang said he is confused as to why officials are forging ahead with this unpopular idea. Locals also oppose the move because it seeks to promote cremation, a practice not always welcomed in rural villages. According to the Beijing News, leveling tombs is just the beginning of Zhoukou's funeral reform plan, which seeks for all the deceased to be cremated. The campaign has simultaneously been rolled out in other parts of the province, including Luoyang, Nanyang and Shangqiu, according to Peng Guoping, an official with Henan's civil affairs department. The publicity department of Shangshui county declined to comment on this story, explaining that the topic is too sensitive to be discussed. But to Zhang, cremation is not fit for the countryside. Stopping people from burying their dead on their own land, and forcing cremation on them will incur anger as cremation carries additional expenses such as transportation. The government does waive cremation fees, however. Zhang strongly opposes the idea of cremation, as it also wastes energy sources and pollutes the environment. Zhang's opinion is echoed by Kou Yinglai, another funeral expert in Xi'an, Shaanxi Province. "Currently, cremation is not actually real cremation," Kou told the Global Times by phone, adding that most people still treat the bone ash as the real body, placing them in a coffin, which is then buried underground. In Zhu's village, all bodies have been cremated for about seven years, and Zhuji has been regarded as a role model because of this for the area. However, Kou's statement rings true here, as villagers do still bury the ashes after the cremations. Kou said local officials do not really care how people treat the ashes as long as they comply with cremation orders, which can then be reported and used by officials as political achievement. "These officials are too shortsighted and are seeking instant benefits," said Kou. "Such campaigns have been attempted before, always without success." What is happening in Zhoukou happened in Paris over two centuries ago. Authorities order that underground graves be emptied, a process that took about 80 years, the Oriental Morning Post reported this month. Zhu said he guessed his village was chosen partly because of its 100 percent cremation rate. To him, what is happening is a mere formality, a publicity stunt to satiate the leaders, without any care given to the potential problems that could erupt. On top of this, his village is near the main road, which is convenient for leaders to inspect it. He referred to a "rumor" circulating among villagers to explain what has been happening. Last year, a top official in Henan Province came to visit the vineyards and saw many grave mounds. "They can be leveled, which is good for giving big machines room to work," one of the village heads told the official. The official is allegedly set to return this year, and the promise to level the tombs must therefore be fulfilled. This could not be verified by the Global Times. "Many potential problems have not shown up yet," said Zhu. He explained that the harvest season has not come yet so people's attention is elsewhere. Furthermore, villagers are kept too busy with work at the moment to truly contemplate the problems that will arise from the leveled tombs. Villagers and experts have their own suggestions that could save farmlands and maintain traditions. "We can make the grave mounds smaller, which can make way for big machines and also save a place for us to mourn our ancestors," proposed Liu. Experts go further, and say outright that cremation should be abolished. For Zhang, ecological burial could be the solution. It requires that people bury their departed family members deeper underground and that other forms of materials be used for the coffins. Kou feels cremation should be abolished, and that burial should also be kept for cities like Beijing and Shanghai. "Some can be buried in their hometowns and others in the suburbs," he said.